This is the newest Nokia cellphone out in the Philippine market, the Nokia C3-00. It is available in hot pink color. Very much perfect for all the pink ladies out there, right? Girl, this is like my dream cellphone! 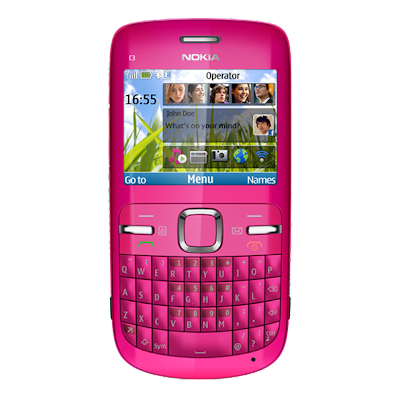 Aside from the pink color, I also love it because of its slim design, big screen, QWERTY keypad, fast Wi-Fi connection, 2 MP video camera, and radio. How come they didn't introduce EC3 before hubby bought me E63 a couple of months ago? Now I am wishing. Awww, superb, I like it! waaaahh, ang hirap pindotin but lovely... hahaha, droping by sis. Hi! It's already out in the market, nung July 31, I bought one at Robinson's galleria (Nokia store) for only Php 6,295. The original price is 7,295php but for that day lang ung promo, ambilis maubos nung units! I think 20 units lang yata ang allotted for each store for the promo..
@vernz: it's not mahirap pindutin sis.. siguro pag sanay ka sa computer talaga, you'll get used to it easily..
@krizia and rhain: thanks girls.. i had to edit my post.. haha.. well, the price is cheaper than i expected.. kasi un E63 is around 11K.. hmmm.. why is that? Oh...my...god...it's so...beautiful, pretty, cute, everything! Give me:D :D It reminds me of blackberry! too bad that I'm looking for a touch phone, otherwise I would so get that one if I could! wow, i must have that pink phone! so cute. wow, really nice. So kikay.